Hey guys! A few days ago I was fortunate enough to get a complimentary makeup tutorial from Clinique. A good friend got me into it and I'm so thankful she did because I really had an amazing time! I chose to attend the session in Clnique Trinoma and was too eager I went there a couple of hours early. Miss Catherine Panteria or Cathy was the accredited consultant who assisted me. She asked basic questions about my skin then started assembling the products needed for the tutorial. I love that Cathy began with Clinique's 3-Step System which consists of cleansing, toning and moisturizing the skin before applying makeup. Next was to find the foundation shade for my skin tone. Although there were an array of shades available, my perfect match turned out to be a combination of two, cashew and warm sunny. Cathy used a wedge sponge and initially tried the mixture on my jaw line. After seeing how it looked, she began spreading it all over my face with a patting motion. I was really impressed with how light and natural it looked on my face. My eyelids were primed with the Clinique Lid Smoothie in Bit O' Honey. It has a creamy texture that applies easily, giving your lids a pop of color with a bit of shimmer. You may use this alone for an everyday look but it can also serve as your primer if you want to blend more colors. I almost gasped for air after seeing the intense colors from the palette. I'm used to neutral shades so this was just what I needed to break away from my usual look. One technique Cathy taught me was how to create cat's eye with a swipe of a pointed cotton tip applicator. It totally blew my mind how a polished look can be achieved in a simple swipe. 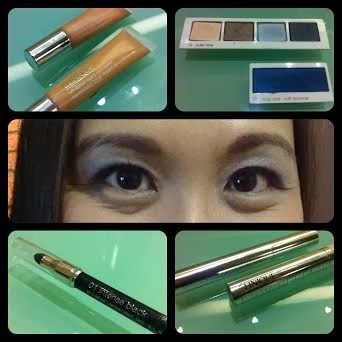 The Clinique Quickliner For Eyes Intense (#01 Intense Black) glides on smoothly with very minimal to zero tugging. It comes with a pointed sponge tip on one end and a retractable stick on the other. There were two types of mascaras used on my lashes, one for lengthening and another for curling. How I wish they come in one tube because they really work well together. Both dried off easily without clumping and made my lashes look more noticeable. If I were to choose a favorite in my entire look, it would be my brows. Thanks to Cathy's skilled hands and Clinique's Quickliner For Eyes Intense (#03 Roast Coffee), my brows looked naturally tamed. I love that the shade matched me perfectly, not at all villain or monster looking the way I always tend to make my brows look whenever I try grooming them. My under eye areas have always been a problem but thanks to Clinique's All About Eyes Concealer, they became less noticeable with just a few dabs. My cheeks were contoured with the Clinique Powder Blush in Enchanted Bronze. This was layered with the shade Berry Delight that added a lovely flush to my skin. You may want to use this sparingly or apply it using light pressure because it can be a bit shimmery when overdone. For the lips, a combination of two shades of the Chubby Stick Intense were used, Curviest Caramel and Broadest Berry. I never imagined them to appear good when layered together but thank goodness they do. My entire look was finished off with Clinique Translucent Loose Powder. It's an effective product that takes the shine off revealing a natural matte finish. This is my finished look! Many thanks to Clinique Philippines' generosity and the expertise of their accredited consultant Cathy, I was granted with a much needed makeover. I had everything done in an hour and this look lasted until late night with minimal creasing of the eye shadow and a few shine on my T-zone. Clinique's hospitality didn't end with a makeover, they also gave us wonderful treats just in time for Chinese New Year! Different sets of Clinique products were prepacked and ready to be given away. Can you beleive I got these for FREE?! It's like experiencing Clinique Bonus Time minus the hefty purchase. I'm so happy about the set I got because it contains everything I've been aching to repurchase like the Moisture Surge Extended Thirst Relief (7 ml), All About Eyes (5 ml), Long Last Lipstick in All Heart and sachets of Repairwear Laser Focus Wrinkle & Photo Damage Corrector. So what are you waiting for? Book a makeup tutorial now with Clinique and have all your questions about skin care and makeup answered by no less than their excellent team of consultants.